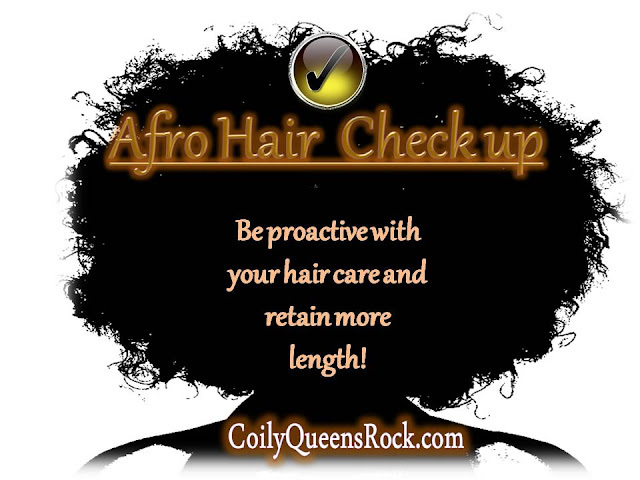 CoilyQueens™ : Two hair checks you should do twice a month. Sometimes breakage seems to just come out of no where, but the fact is, it started somewhere. Breakage does not just happen, it happens as a result of something you are doing or not doing. If you are on a journey to grow your hair as long and healthy as possible, here are two hair care checks you should do twice a month. I created this term to describe what the hair does when it is not properly hydrated. It forms webs when you separate it. When the hair sticks together in web like fashion this is called webbing. When the hair webs, this means your moisture routine is not working properly for you. This is a check up you want to do every other week. You always want to be proactive with hydration. Check four areas of your hair, the top, back and both sides of your hair for webbing. Just examine a small section from each area, if more than two areas show webbing, this means your hair is not hydrated enough. Dehydrated hair left untreated will eventually break or split. So correction is in order. Before you blame your moisturizers, take a good look at all the other products you use on your hair. Certain harsh ingredients can pull the moisture out of your hair. Examine your cleansing and conditioning technique, be sure you are not missing any steps and you are shampooing and conditioning correctly. Untangle your hair over the white sink in your bathroom. Examine the hair you see fall onto the sink. How does it look? If you see long pieces the length of your hair, that is normal shedding. If you see hair which is shorter than your hair that is breakage. If you see very small pieces of hair no longer than an eyelash, those are from split ends. Those small pieces of hair have broken off from your hair strands, and this has left a weak spot on your hair strand. This means it is likely that your hair will eventually break, even with normal manipulation. First shampoo and deep condition your hair correctly. Steps to correct deep conditioning here. Once you have finished and your hair is dry, smooth your fingers through your strands again. 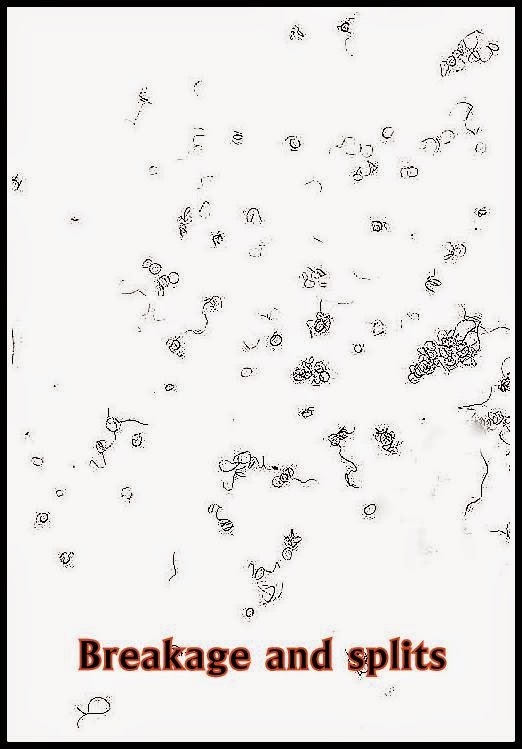 If you still see short pieces in the sink, then do a protein treatment asap, to stop the breakage. WHAT WILL THE PROTEIN TREATMENT DO? The protein will stick to the individual hair strands, and give them the strength they need to survive manipulation. The hydrolyzed keratin protein will fill in any holes on the hair strands, left from the splits. After using a good protein treatment such as the aphogee 2 step, your breakage should stop by 50% or more. You should no longer see those short pieces in the sink. Be sure to follow the instructions of the protein treatment you choose. TIP: IF YOU LIKE YOU CAN APPLY THE PROTEIN ONLY TO THE ENDS OF YOUR HAIR. DO THIS IF YOUR BREAKAGE IS NOT SEVERE. YOU HAVE TO BE THE BEST JUDGE IF YOU WANT TO TAKE THAT CHANCE OR NOT. Nice post , I just washed my hair and some of it is defined while some of it has a lot of webbing. Thanks for the tips! I am dealing with webbing again I think. My roots are super thick and feel like I have when I had a relaxer when they were rougher than my smoother strands. I cut my hair over a year ago and its growing back again and the same thing is happening. Ugh! My hair feels soft and appears to be super moist. I haven't been able to wear ANY style with definition because the humidity turns my hair into a short afro no matter what. My twist outs and braids out have all failed. My hair reverts almost immediately after being stretched from a braid or twist or banding and the roots are murderous. Ugh! A question I have - how much breakage is normal? I know we can't retain all of our length so we have some breakage right? Great information! I never thought about that. I'll check my hair today to see if there is any webbing. Thanks for the information! My question is regarding protein. I read that low porosity hair is sensitive to protein. In your opinion, is it best to use the Aphogee 2 step or Palmer's treatment with coconut oil? I read somewhere that the Palmer's is easier on the hair compared to the others. Here's my comment: I followed the 9 day regimen and it seemed to help. It hasn't been long since I did it and my hair is webbing again. Because my curls at the roots aren't super defined, I prefer twist outs over wash-n-go's. But I guess I'll have to twist every day if I want to follow it again. The palmers is a weak product I never recommend it. The aphogee 2 minute reconstructor or the aphogee 2 step is the best in terms of protein treatments. When you finish the 9 day regimen you then need to follow a good moisture regimen such as switching to the CoilyQueens Regimen. The Nine day is just to give you faster results, like a jumpstart. But hair must be hydrated over time. So immediately after completing it you graduate over to the CQR and your results will be amazing. The roots will eventually become defined.